The Twister 852 features a Fanless Aluminum chassis which is simple, compact and stylish. 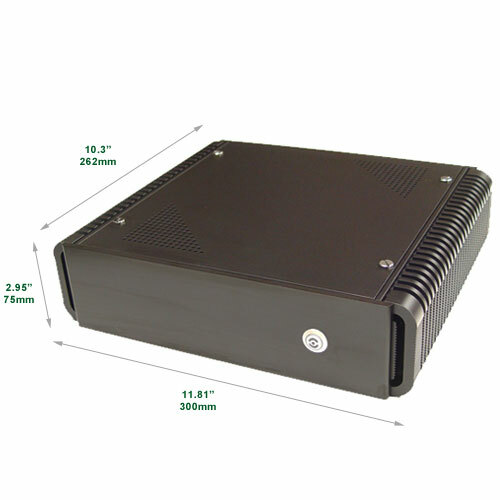 It can be applied as a Thin Client, network device, set-top box, VPN, VOIP, and POS system. The major material is Aluminum for excellent heat solution. The Twister 852 system can operate very well without a CPU cooler fan and reduces the risk of system fan failure possibility, while providing the performance of an Intel Pentium M processor. The Twister 852 system provides a 2.5" slim HDD or a 3.5" standard HDD space. The Twister 852 also provides a PCI slot expansion (with 2.5" HDD) for extension requirement. Related Products - Customers who purchased Twister 852 also purchased . . .
- Max PCI Card Dimension: 8.5" x 6.0"